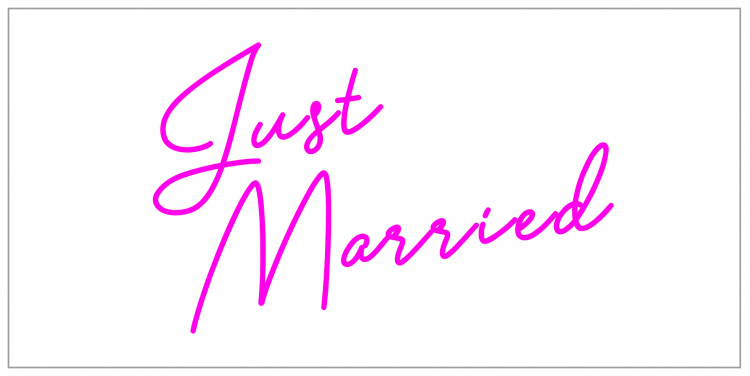 Design Personalised Neon Signs for Names, Weddings, Bedrooms. Personalised Neon signs for Names are increasingly becoming a wildly popular decor piece, with people’s homes, weddings, at offices and stores, as well as many other locations. Why? Because they’re a creative, stylish and bright way of highlighting a particular space and they act as a powerful alternative to traditional signage. In particular, we’re getting a growing number of people enquiring about the capability to design personalised neon signs for names, whether this is for an event like a wedding, engagement or birthday party, or as a sign for a man cave, bedroom or rumpus. Here at Beyond Neon Signs, we’re proud to offer an extensive range high-quality text neon signs that can be used for a whole range of practical purposes – it’s up to your creativity. But how do our neon signs work in the first place? How are their colours produced? And why should you consider getting one over more traditional forms of signage? Read on for details! How do neon text signs work? The functionality of neon signs is based in science, so let’s try and understand exactly how this works. Neon lights are essentially glass tubes that contain a small amount of neon gas (an “inert” gas). By applying an electric voltage to electrodes situated at either end of these tubes, light begins to glow from the gas’ atoms. This voltage accelerates a free electron, giving it kinetic energy to “ionise” the gas atoms which become positively charged. The overall mix of positive and negative icons allows the electrical current to flow through, and this creates the light you can see. Very similar to glass neon, but without many of its drawbacks, is one of the latest modern lighting technologies known as LED Neon Flex. By taking advantage of advanced LED technology and materials, LED flex lighting looks just like glass neon lights but is not constrained by the rigidity of glass, so is flexible instead. These work by using ultra-bright LED lights with almost identical wavelengths, to ensure a consistent emission of light. The PVC casing allows the light to glow outwards and enhances the perceived overall brightness. At Beyond Neon Designs, we utilise LED Flex technology as a more affordable and effective form of lighting for our customers. Easy to cut with standard tools and bendable to form all kinds of shapes and designs, LED flex lighting is much safer, more durable, easier to install and lasts considerably longer. How do neon text lights get their colour? Again, science explains to us how and why neon text lights manage to emit different shades of colours. Rather than removing electrons through kinetic collisions, they can be “excited” instead, which brings them to an orbital of higher energy. As the electrons return to their original orbital level, this energy is transferred to a light particle which creates a glow. The colour corresponds to the light particle’s wavelength, which is influenced by the energy difference between the orbitals. What about LED Flex technology? 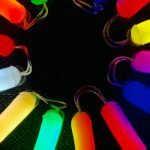 LED lights are essentially constructed from tiny semiconductor elements, and the materials used to create these determine the colour emitted by the light. By slightly altering the composition of the alloys used to create these semiconductors, you can achieve the colour shade you want. The benefits of using text neon signs over traditional forms of signage are significant. Just a few reasons why you should opt for this more modern alternative include the fact that when they’re properly designed and built, they can last considerably longer than traditional signs which might rely on normal light bulbs which may only last 6 months to a year. Neon signs tend to have a warmer and more aesthetically pleasing glow over LED signs which are generally just really bright. Neon signs also use significantly less energy and have better power consumption levels, which results in a much-appreciated electricity bill as well! 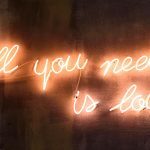 Additionally, in comparison to painted or printed signs, text neon signs have the bonus of being able to be viewed at night without requiring extra surrounding lights, and they’re undoubtedly a more modern take on showing off your brand name. 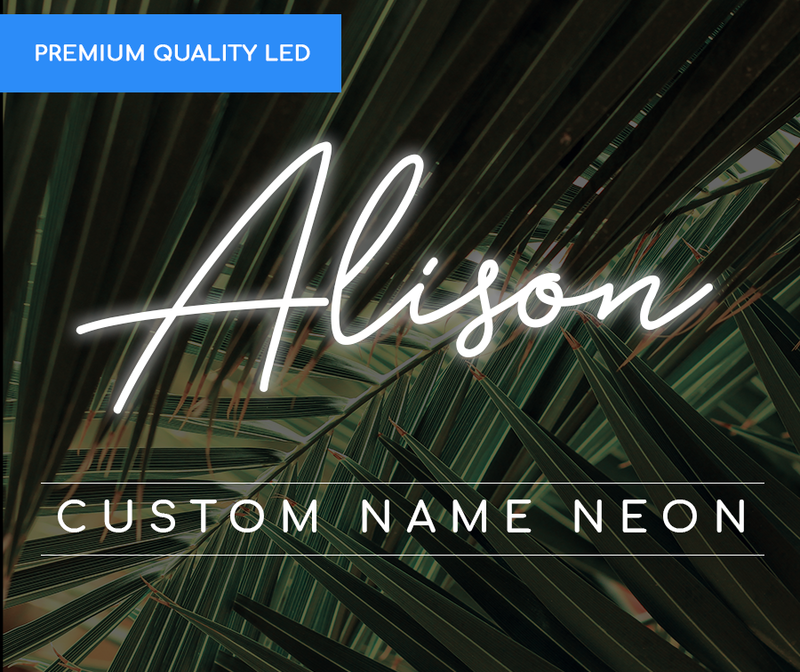 Beyond Neon Signs are excited to offer an easy-to-use neon light configurator, which can be used to customise your personal neon text signs online! It’s a simple yet powerful platform allowing you to visualise exactly what you text neon sign will look like prior to ordering, and you can mix and match colours and designs until you have the ideal final product. The first step is to choose the text, like a name! Whether it’s just the first name or a full name, simply type it in and see the visualisation automatically update, literally bringing your name to light. Then choose from a variety of different fonts, from spaced text to script style writing. Select the colour for your neon lights, either classic blue or pink or something totally different. Next is the type of mounting you want behind your neon text sign – either transparent cut to shape or transparent rectangular. Both are popular options! Finally, pick the size for your sign. Go for a small 50cm wide sign, or a medium 90cm wide one, or the large 140cm wide option. These also range in price which are clearly laid out for you to choose from. Additionally, you can switch the background of the configurator from brick walls, to wooden panelling, to a white bedroom and more. This really helps to imagine what your sign will look like, wherever you’re planning on putting it! Keen to get your hands on one of these stunning neon signs? Want to lighten up a space with the glow of your name? Look no further than Beyond Neon Signs with our unique online neon light configurator, and get started now! Alternatively, reach out to us directly to chat about what exactly we can do for you, and how we can work together to make neon text signs and bring your ideas to life.